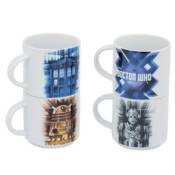 Doctor Who Stacking Ceramic Mug 4-Pack:Show some fan love in your home every day! This Doctor Who Stacking Ceramic Mug 4-Pack is an awesome stacking set! Made from ceramic. Hand wash only. Not dishwasher safe. Do not microwave.